When the Waters Rise was designed for Oxfam as part of their Grow campaign – to raise awareness about the effects of climate change on women farmers in the developing world. 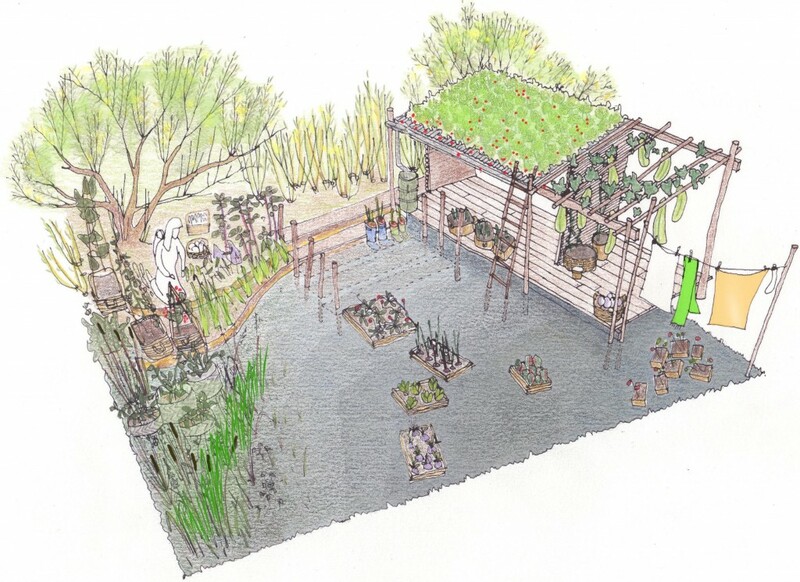 Exhibited at the RHS Tatton Park flower show, the garden demonstrates the adaptations that women in Bangladesh have adopted during periods of flooding. These include the use of floating mats planted with edible crops, rainwater harvesting, planting on high ground including roofs and terraces, and the use of flood-tolerant plants to strengthen embankments. The garden seeks to show how these adaptations could also be adopted in the UK context in areas of heightened flood risk. Embracing the participatory spirit of Oxfam campaigns, the project involved individuals and community groups across the North West who cultivated fruit and vegetable plants that were used in the final garden. The garden contributed significantly to Oxfam’s Grow campaign, engaging directly with volunteers and visitors, as well as thousands of others through coverage on the BBC.